With so many choices in bead cord and thread it can be overwhelming. How can you choose among all these options? We’ll walk you through the steps, and give you some tips in choosing which cord you’ll need with each style of jewelry project. For long-lasting jewelry designs, we recommend a product that is durable and can stand the test of time. All of the products we sell are made to stand up to everyday wear and tear, but there are some subtle differences between them. This guide will walk you through the various options. Next, you will need to decide if you want your cord to stretch or not. If you want your jewelry to stretch there are a variety of stretchable cords to choose from, like Elasticity or Stretch Magic. To make a design with no stretch, you'll want a Silk Cord or Nylon Cord. Silk Cord won't stretch at all, while the Nylon Cord will stretch a small amount which helps to create precise knots. Between stretchable and non-stretchable cords, there are a few varieties of each. Let's take a closer look at the styles that stretch and those that do not. Griffin Silk Cord is a great choice for pearl necklaces as it is very soft, with little stretch and knots evenly and consistently. Our Griffin Silk Cord has a needle pre-threaded onto the cord which makes it very easy to use. Silk is an all natural material made by moth caterpillars. 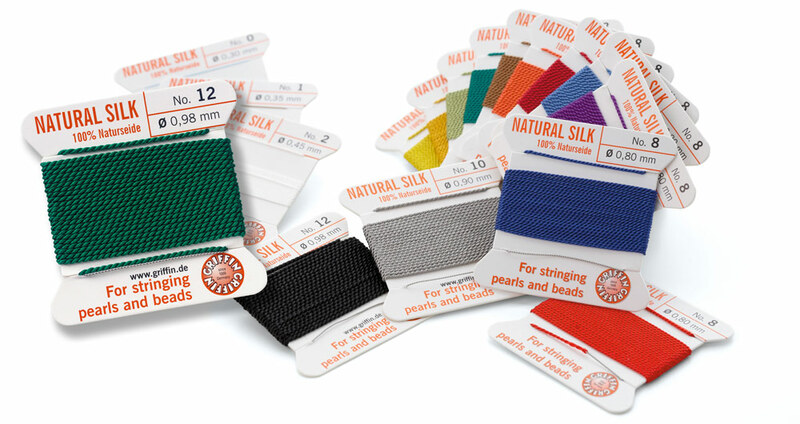 Silk is surprisingly durable, and has been the go to choice of pearl stringers for hundreds of years. In addition to stringing pearls, we recommend silk cord for bead designs like Swarovski, Czech Glass Beads and gemstone beads. Griffin Nylon Cord is a great alternative to Silk. It knots consistently and evenly like Silk, but Nylon is even more durable and less likely to fray from sharp bead edges. Nylon does have a bit more stretch to it, so we recommend tying a weight to the cord and stretching it before you being stringing. Just like Silk Cord, our Griffin Nylon Cord comes with a pre-threaded needle to make your bead stringing quicker and easier. Wildfire is very popular bead cord for its durability and consistency. This cord is a synthetic material that is built to last, is extremely strong, 100% waterproof, won’t fray and has near zero stretch. Wildfire has a thermally bonded coating adding to its durability and smoothness. Wildfire is great to use when stitching beads with techniques like peyote and herringbone stitch. Dandyline is similar to Wildfire in that it is very strong and flexible, but Dandyline has an advantage in its smaller diameter. Dandyline is a braided cord that is extremely strong, yet remains flexible and soft. 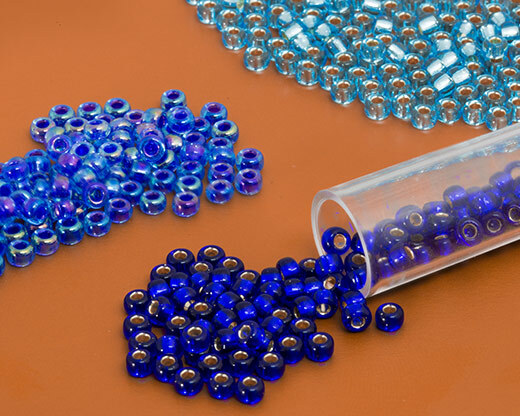 It is very popular for stringing Swarovski beads. 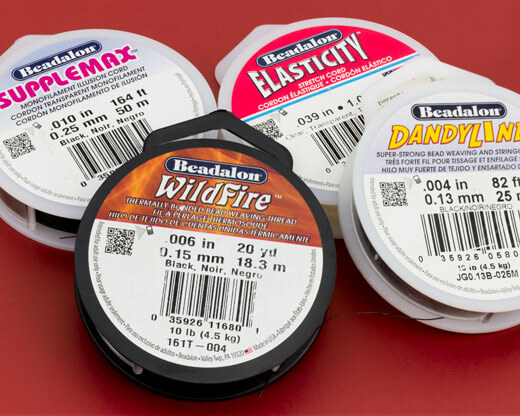 The thin width of the Dandyline makes it ideal for seed beads and other beads with small holes. Supplemax is great for illusion style necklaces as it is soft, flexible, and almost invisible and does not stretch. If you are making a floating or illusion style necklace, you’ll need SuppleMax. This clear, nylon thread is super soft and drapes beautifully. Because it is so light in color, it is nearly invisible, so it does not distract from the beads. It is soft and not as durable as other threads, so it is an ideal thread to use with plastic, wood and other non-abrasive beads. Nymo Nylon Thread is a lightly waxed nylon thread that is very strong and is available in a wide variety of colors. Waxed thread can be beneficial in your jewelry projects as it makes it stiffer and easier to control. Nymo thread is a great choice for beginner beaders as it is very inexpensive and easy to use. 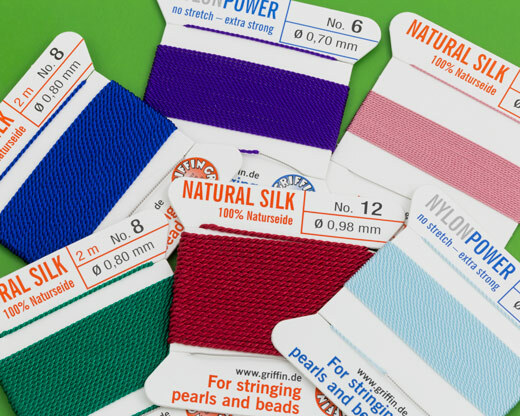 Nymo is a monofilament thread, meaning it just has one single bonded strand, not multiple strands twisted together. This comes in handy if you ever need to remove stitches as the thread won’t untwist and separate. Nymo thread is ideal for seed beads as well as other loom and bead-weaving projects. For stretch bracelets, anklets, hairbands or other jewelry projects where, instead of a clasp, you need to slide the jewelry over a hand or foot, consider Stretch Magic, Elasticity and Opelon. All of these cords are great choices when it comes to stretchiness, and it really is just a matter of personal choice. But, there are some subtle differences. Stretch Magic is a clear cord that is popular in use with Swarovski Crystal and Czech glass beads. It is very soft and after it stretches, it always returns back to its original size, keeping the beads nice and tight. Elasticity will stretch just like a rubber band, then returns to its original size, and is available in metallic colors like Satin Gold and Satin Silver as well as the original Clear. Opelon is a slightly fibrous stretch cord which is very strong, and because it is a flat cord, once knotted, the knots are almost invisible, so there is no need for bead crimps. With a variety of styles and colors to choose from, you can always find just the right cord or thread for your next jewelry design at JewelrySupply.com. 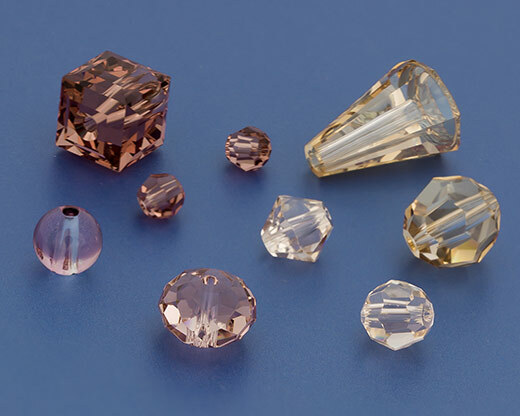 Shop our store categories below to find thousands of great jewelry making supplies.